Google celebrating CV Raman's Birthday with a Doodle today on 7th November 2013. CV Raman or Chandrasekhara Venkata Raman was a physicist and he was awarded the Nobel prize in Physics in the year 1930 for his work which is known as Raman Scattering due to Raman Effect. CV Raman was born on 7th November 1888 in Thiruvanaikoil, Trichinopoly, Madras Province (Tamil Nadu), India. 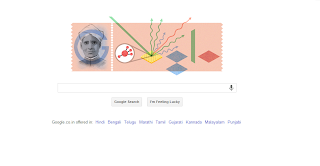 This year it's 125th Birthday of Sir CV Raman.